Jordan Peele is back on movie theater marquees with his next sure-to-be hit horror film, "Us." The movie begins with silent, shadowy figures appear in a family's driveway outside their isolated home, setting an eerie image for the film's terrifying and provocative plot. The acclaimed writer-director told ABC News' Chris Connelly for "Nightline" that he knew while writing the movie that would be his "iconic image." "They're standing there and they're waiting for you to make the move or something. You don't know," he said of the creepy shot. "They're steps ahead. And then finally when they do come -- the pit of your stomach is supposed to drop out from under itself." Throughout "Us," Peele deployed a similar skill set audiences saw in his 2017 hit, "Get Out." 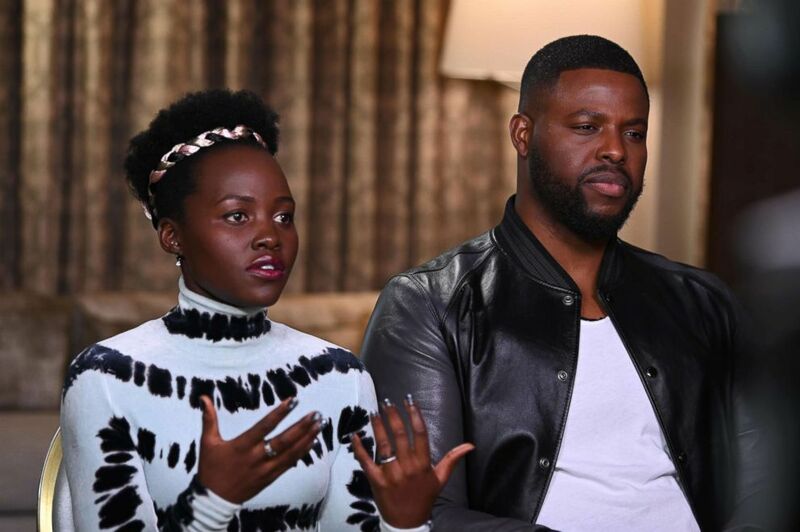 Lupita Nyong’o, who stars as Adelaide Wilson and her character's doppelganger, Red, said the crux of her character’s fears stem from childhood trauma. "She is a woman who is riddled by this trauma from her childhood that she just can't shake off," the actress explained. "There's other things going on that she must suppress." 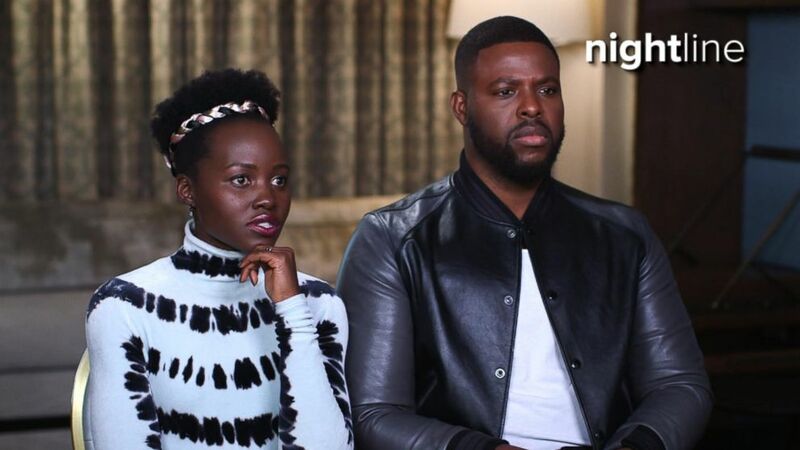 Lupita Nyong'o and Winston Duke chats with Chris Connelly for Nightline on their roles in the horror film, "Us." Peele uses the feeling of fright to challenge his audience's mindset. "I love horror because it invokes -- a physical reaction," Peele said. "It gets a visceral reaction. It gets an audible reaction and it makes you feel first." He continued, "Art that makes you feel ends up making you think." "Us" also provides social commentary amid some terrifying scenes. 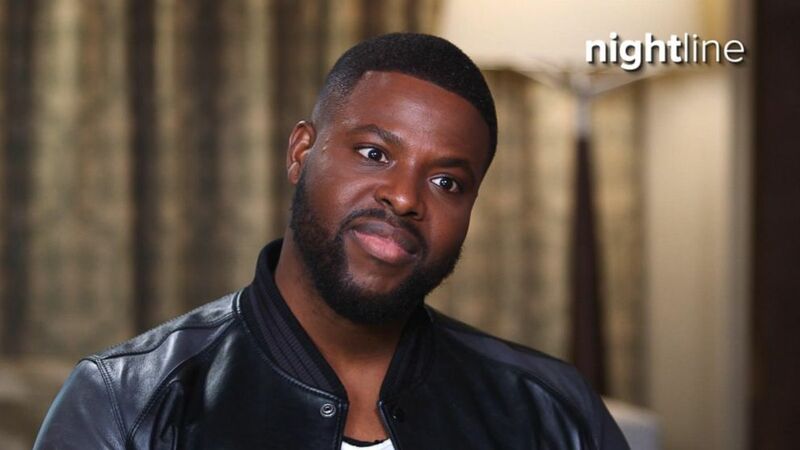 Gabe Wilson, played by "Black Panther" star Winston Duke, and his family battle the ferocious evil twin versions of themselves. "It is in our nature to fear the invader, the idea of the outsider, the alien," Peele said. "I think that we are our own worst enemy because we are so capable of lying to ourselves." Jordan Peele sits down with ABC News' Chris Connelly to discuss his latest project, horror film, "Us." Peele said people lie about guilt, shame and sins. "We're very good, especially when we get together, at saying, 'It's not us. It's them.' And when you suppress something -- as a group, whether it's racism, classism, xenophobia -- historically, we see it come out in atrocious ways," the director explained. Nyong’o added, "When that shadow self, that darkness in us is left unattended to, it can swell out of control, rear its ugly head, and cause a lot of destruction in the world." "Oftentimes, the darkness in us is something that we project onto [one] another," she added. "In this film, Jordan [Peele] makes a monster out of that darkness and shows what it would look like if that darkness came for us." Peele said his "Us" double personas were inspired in part by a 1960 episode of "The Twilight Zone" entitled "Mirror Image." "There's something terrifying that happens when you stop -- living for just yourself," Peele reflected on becoming a father two years ago. "Just going from not-a-dad to a dad is, like, confronting yourself. But there's a completely different reason for living. So I think that's part of it -- having a kid around this time." The longtime comedy actor turned from comedy to psychological thrillers more than two years ago, and won an Oscar for best original screenplay with his debut film, "Get Out." "The power of Jordan's work is that he's redefining a genre, a genre that often says blackness is the first casualty," Duke said. "In 'Get Out' he said, 'What else could be the first casualty?' That was racism." 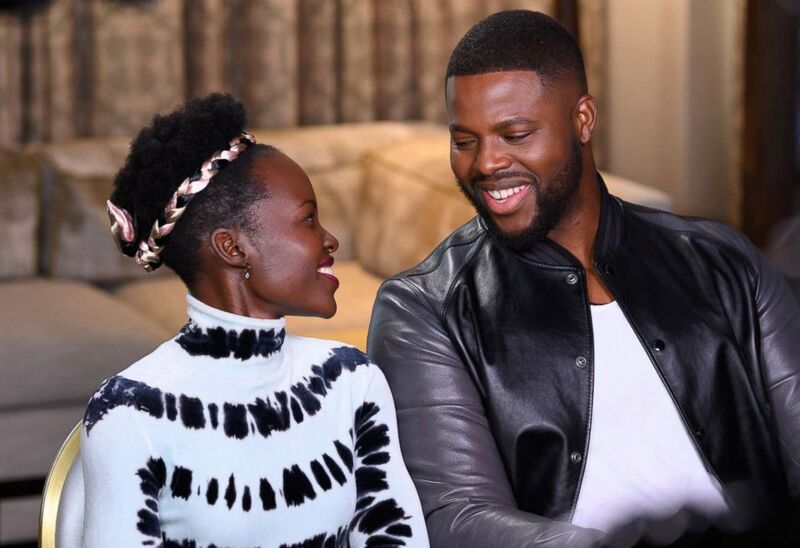 Nyong’o said she watched Peele's first flick five times in theaters over the course of a month, while still filming "Black Panther." "We went as a cast -- we went to a bar afterwards and for three hours we were just talking about what we had all seen," she recalled. Peele said jokingly that getting the actress, who was already a fan of his work, "was like pulling teeth." "And the performance that she gave me or the performances, I should say, I think are two of the iconic horror performances of all time," Peele said. Peele questioned how he could make a movie that would convince the audience "that they're watching eight performers, when they're actually watching four." Nyong’o said the dual act "very tough" for her to pull off "because you never meet your scene partner." "Oftentimes it was just a green 'X' on a wall and that you had -- to perform towards," she explained. "There's this menace coming for you, and -- it's nowhere to be seen," she added laughing. "It was almost like having to do two movies at once," Duke said. 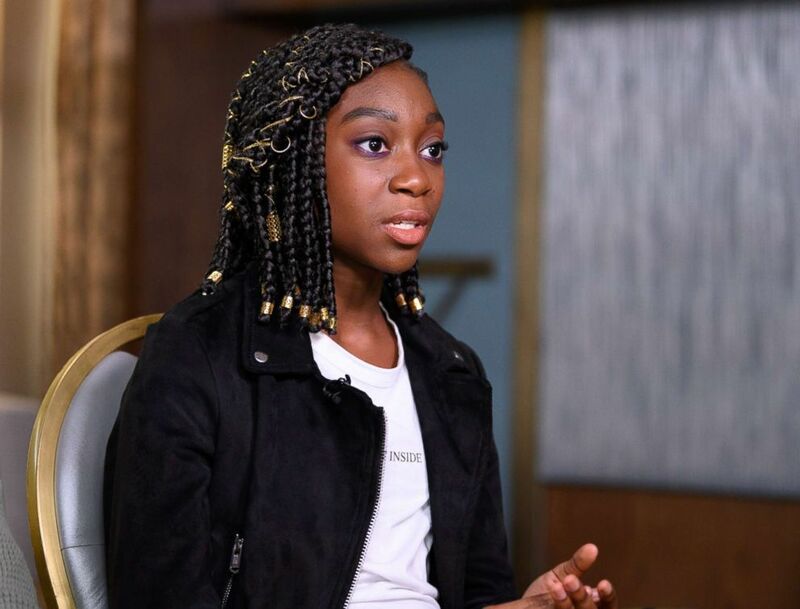 Shahadi Wright Joseph, who plays their on-screen daughter Zora Wilson, said Peele would direct her by explaining, "'You've been running for about 20 minutes. You're tired. You know, you have to save your mom.'" Evan Alex joins Joseph as her on-screen brother, Jason Wilson. In the film, these young actors also play two characters each, embody all emotions in a fight to survive and commit heinous acts. "That is challenging because sometimes we'd have to go back and forth with the characters," Alex said. "When we were in the good characters, Jordan [Peele] would try to lighten up the mood. But when we were in bad, it was kind of quiet so we could all get in... our emotions." Evan Alex speaks with ABC News' Chris Connelly about playing Jason Wilson in "Us." Joseph said she liked how "fierce" her character's doppelganger, Umbrae, is. "She was so confident," Joseph said. "I loved that about her because she's had this terrible life, but yet she sees happiness in going after the one person that she wants to be." 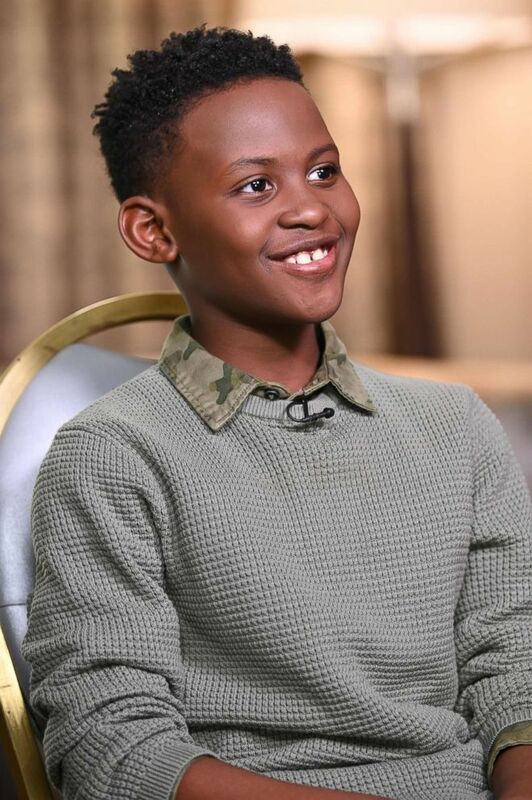 Shahadi Wright Joseph speaks with ABC News' Chris Connelly about playing Zora Wilson in "Us." "I had somebody who saw the movie say, 'I didn't realize that was Lupita,'" Peele revealed. "I was like, 'Well, you are an idiot, but thank you.'" His authoritative artistry has made Peele a true player in Hollywood. He also recently helped produce Spike Lee's hit film "BlacKkKlansman," which won the Oscar for best adapted screenplay this year. "Us" will mark yet another significant moment in cinema from African-American filmmakers and performers. "I feel our generation, our cohort of artists at this time is doing something that others haven’t had the opportunity to do," Duke said. 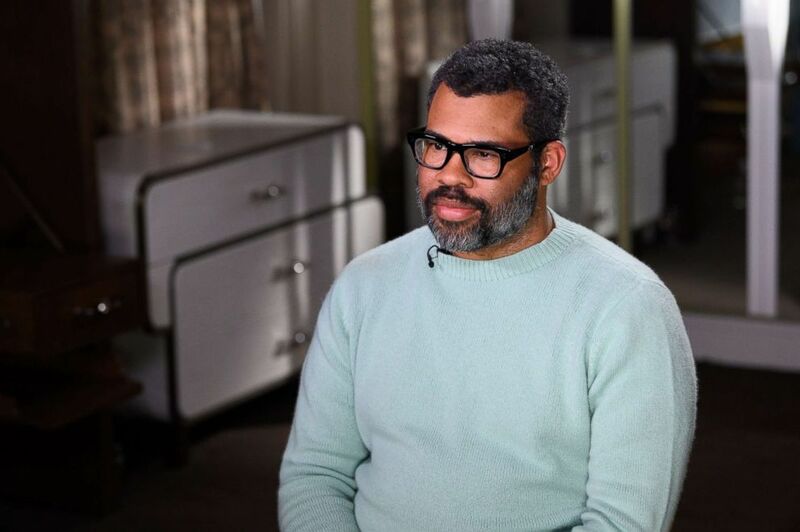 Peele said the idea that seeing a movie with an African-American family at its center is new is "sort of [a] tragic reminder of the lack of meaningful representation -- in this industry." He continued, "I think it's very meaningful to the black community to see black faces in a film that's not about race." "Now that we are represented, the conversation a lot of times is about nuance," Duke said. "I think that's the thing is the trope of normality with this family that allows you to say, 'Hey, that's actually my family. That's the image of the all-American family, whether they look like me or not.'" Peele's budget for the film was just $20 million, which is lean by Hollywood standards. Peele said he tried to always stay true to himself. "I always would return to this idea that with 'Get Out' I made my favorite movie that doesn't exist," Peele said. "When the pressure gets too loud or -- the stakes get too high," he said, "I can always return to that: make my favorite. What movie would I most like to watch right now? Make that movie." "And by the way, when you make that, it tends to work," the famed director said. "I think people respond to your truth -- when it's real."